Holmes Institute is proud to welcome students to Holmes Master of Professional Accounting (MPA). This masters degree has been custom designed with inputs by the faculty and professionals in the field. This combination of academic and professional knowledge has resulted in a contemporary course relevant to today's international business environment. By combining the core professional accounting subjects with a strong foundation in general business, the course seeks to ensure students graduate with the broad range of skills and competencies required for a successful career in accounting and business. Graduates will not only be professionally competent in the theoretical and technical aspects of accounting, but will also have the well developed analytical and communication skills necessary to equip them for leadership positions in their professional and business lives. Initiate awareness of and a strong start in developing the professional attitudes, obligations and ethos that Accountants require and must sustain on a lifelong basis. Holmes MPA is accredited by Chartered Accountants Australia and New Zealand, CPA Australia and the Institute of Certified Management Accountants. This subject serves as the introductory accounting subject for those going on to specialise in professional accounting. It aims to provide an understanding of the main accounting concepts and techniques including the processing of business transactions through an accounting system. This introduction subject in finance introduces students to the notions, tools, and scope of wealth management from a corporate and personal perspective. This subject feeds into and provides a solid knowledge foundation for Personal Financial Planning, Investment, Client Relationships, Marketing for Services, Business Statistics, and Financial Plan Construction. Macro and microeconomic issues relevant to business are canvassed in terms of the broad business and economic environment and range of settings in which managers work. The focus is on the development and use of economic principles and tools that equip business managers to operate in these settings. Questions addressed include: what makes firms competitive as well as what makes economies successful in a global environment. Policy issues addressed include: the issue of trade versus aid, imports and exports, investment and taxation policy. This subject aims to provide students an understanding of the main management accounting concepts and techniques including costing, budgeting, performance measurement and the use of accounting information for short-term decision making. This subject examines accounting-based information systems and business processes. Concepts relating to the management and organisational use of computer-based information systems are explored, in particular, the design of accounting-based information systems able to provide support for business strategy formulation. The theoretical framework and practical techniques of accounting for corporate groups forms the focus for this subject. Areas considered include company formation, profit distribution, capital reconstruction, liquidation and preparation of consolidated accounts for groups of entities required under Accounting Standards and Stock Exchange regulations. The aim of this subject is to assist students develop their knowledge and understanding of various theoretical models of accounting and to apply that knowledge and understanding to specific financial reporting issues that are currently the subject of the Australian Accounting Standard Board (AASB) accounting standards and/or to emerging issues. This subject introduces students to key external and internal auditing principles and procedures including objectives and limitations of auditing. Students will also gain an appreciation of key issues relating to ethical and legal considerations including the planning and design of audits, the performance of audits preparation of working papers, and the rights and obligations of auditors, company principals, and the users of audited financial statements and/or other materials/opinions produced/given by auditors. This subject introduces students to business and corporate law and rapidly moves them to a graduate level of understanding and proficiency. Students will not become lawyers (that is beyond the scope of this subject), rather, they will have a good understanding of when they need a lawyer, what the lawyer can do for them or their client/s, and how to instruct a lawyer. The content in this Commercial Law subject feeds into a variety of business subjects, including Personal Financial Planning, Insurance, Investment, Estate Planning, various types of Accounting, and Marketing for Services. This subject introduces students to business and corporate tax and rapidly moves them to a high level of understanding and proficiency. Students are not expected to become Tax professionals (that is beyond the scope of this subject), rather, they will have a good understanding of the tax implications of investment strategies, when they need a tax professional, what a tax professional lawyer can do for them or their client/s, and how to instruct a tax professional. This subject seeks to engage students in the exploration of statistical analysis applicable to a variety of business settings for the purpose of business decisions making. Emphasis will be placed on explaining and justifying the use of statistical analysis in the context of critical reasoning in business problem solving. In addition, appropriate research methodologies and techniques (qualitative and quantitative) are elaborated as the strategy for an approach to business problem-solving. Statistical packages such as Excel and SPSS are used. Different data presentation techniques are also discussed. This subject seeks to engage students in the business research process: how to plan, organise and carry out a business research project. 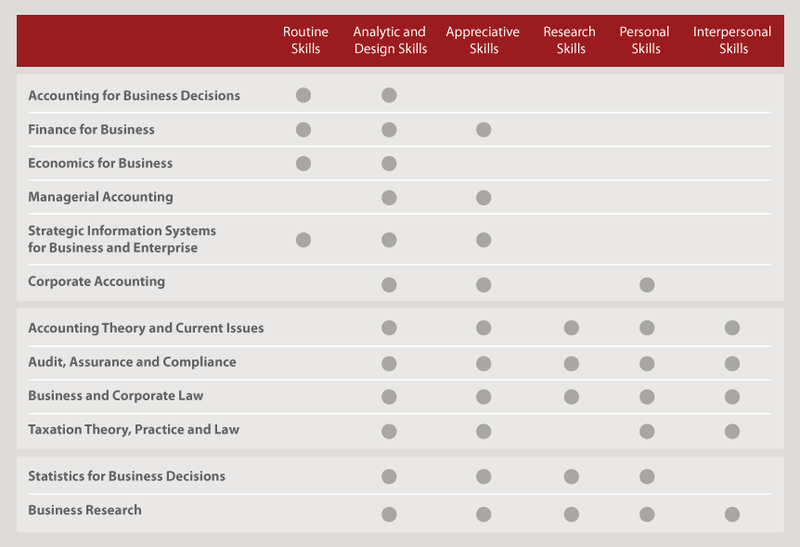 The business research process is investigated from the identification and definition of a suitable business research question, the conduct of a thorough literature review, the selection of an appropriate research methodology for data collection and analysis, and the writing of a research paper. The ethics of business research is also addressed.